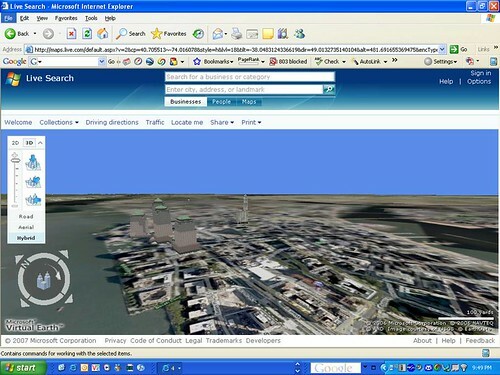 geothought: Virtual Earth 3D in New York?? I have heard from several Microsoft people that they had created a 3D model of New York City but it just hadn't gone online yet. So I was pretty excited to see the Virtual Earth for Government blog announce that this was now live and "man is it ever cool" - and they have a very cool screen shot to back it up. But sadly when I flew over to New York, I just saw a handful of 3D buildings on a flat map :( ... hopefully it will be there for us non-Microsoft people soon, but not quite yet I guess. 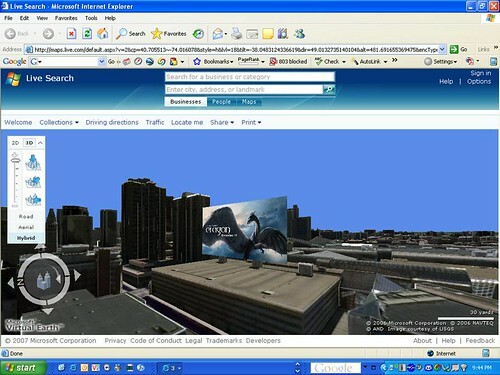 I flew back over to Denver, which does have a very cool 3D model, and saw an advertising banner for the first time - I have seen talk that Microsoft was going to add banners in, but this is the first one I have actually seen. It was a large banner for the movie Eragon, suspended above the Denver Performing Arts Center - here's a screen shot. One cool thing about Virtual Earth which doesn't seem to me to have been very widely publicized is that it works with an XBox 360 controller - you can just fly around using the joysticks and buttons, which is much smoother and easier than using a mouse and keyboard. After someone from Microsoft showed me this, I went and bought an XBox controller just for this!